Space travel is one of the most fruitful tropes in the history of cinema. From German expressionism with Fritz Lang’s highly influential film Frau im Mond —which was one of the inspirations for the actual construction of the German V-2 rockets and the first instance where we see the famous countdown to zero before the take off—to extravagant American blockbusters like Interstellar or The Martian, the idea of outer space, distant planets and spaceships has been variously represented. It’s easy to see why the idea of casting off is appealing to filmmakers. It opens up a whole new ground for fictional representation. “To go out from this world to enter into another, where nothing will be the same” (Serres, The Natural Contract) means to change our entire environment, our known networks and even to readjust our perceptual apparatus. This has encouraged creative efforts to address the matter from different perspectives. Some seem preoccupied with our dependence on technology and the difference in the perception of time, others with the dangers inherent in living in alien environments but I guess one of the points of convergence in most of these films is the representation of outer space hostility. Considering the case of Destination Moon (1950) and Gravity (2013) I will try to explore how outer space ecology is represented in different historical moments. The upward scrolling letters of the opening titles of Destination Moon would sure seem familiar for contemporary viewers watching the film for the first time. It is no wonder that George Lucas wanted make a little homage to this film in his famous movie franchise. Destination Moon was the first major American science fiction film about space travel but aside from that, the film is a very important historical document that addresses many national concerns and would prove prophetic of the events that will unfold in the years immediately following its release. In the plot of the film there are allusions to an unnamed non-western power developing rocket technology and posing a virtual threat if it managed to arrive to the moon first. This certainly mirrors American anxieties about a Soviet nuclear attack and would anticipate the space race that would culminate in the Apollo moon landings in the early seventies. Correspondingly the film seems quite worried about the presentation of a realistic account of space travel. The way outer space hostility is conceptualized turns the film into a drama about the feasibility, the realistic means and the inherent problems of space travel. The whole plot is an exhaustive list of probable complications the astronauts might encounter as well as very ingenious solutions. It goes from the financing of the operation (comically resolved by showing some investors a clip from Woody Woodpecker), the actual building of the spaceship, the design of the spacesuits to the problems they experience in the actual journey. Aspects that nowadays are common knowledge about space travel like nausea, weightlessness, and the difference in gravitational pull of the moon are treated as surprising bits of data that are being revealed for the first time. However, the film is indeed clever and resourceful in posing and solving its different conflicts. Take, for instance, the scene in which a radar antenna is frozen and the crew has to go out to get it back inside the ship. The ship seem out of scale and the spatial background rudimentary but when one of the crew members goes adrift they cleverly manage to save him by using an oxygen tank as a means of propulsion. Moving to 2013’s Gravity we jump to a whole different era in which outer space has actually become a kind of extension of our earthly environment. It is a space full of satellites and space stations pertaining to different nations. The characters also seem more adapted to the environment with the exception, at first, of Dr. Ryan who is apparently on her first mission. While doing some repairs on a satellite she is feeling nauseous and ground control in Houston is able to monitor her anxiety levels. Meanwhile her mission mates are cheerfully playing music inside their suits and doing zero gravity somersaults. Ironically this human modified space is precisely what renders the environment even more hostile. When the planned destruction of a Russian satellite goes wrong, the debris begins travelling fast along the orbit of earth destroying everything in its path. Since this is a film with much more resources to its disposal, the experience of outer space dwelling is greatly enhanced. It was filmed in digital 3D which gives a deeper texture to the characters and the objects against the spatial background, and also intensifies the sense of vertigo in the action scenes with the debris causing damage to space stations and Ryan and Kowalski going adrift. There is also a constant shifting between a first and third person perspective that adds up to the jarring orientation effect. 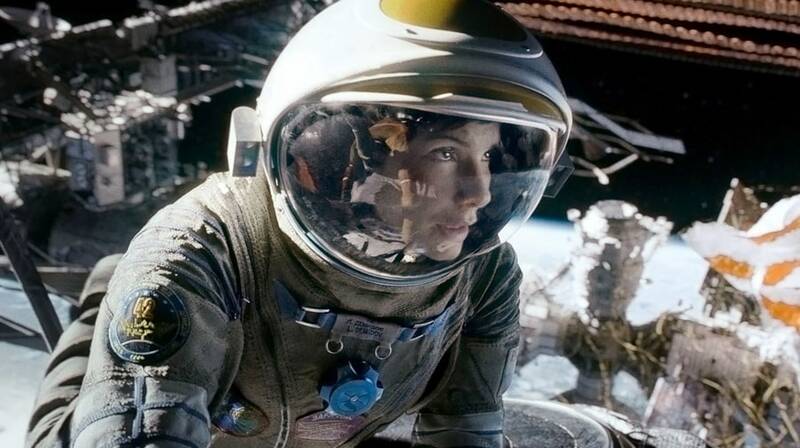 In Gravity the representation of a hostile environment is transferred to different outer space scenarios. The first of these is the spacesuit itself, with its nausea inducing effects in space and its limited supplies of oxygen. Then we have satellites and space stations in danger of being blown up and unleash a chain effect. Even the inside of space stations seems unstable as the slightest spark of fire might cause the whole structure to explode. Gravity opens with the lapidary text: “At 600km from planet earth the temperature fluctuates between +258 and -148 degrees Fahrenheit. There is nothing to carry sound. No air pressure. No oxygen. Life in space is impossible.” And it seems that even with our growing knowledge of outer space ecology and the many ways in which space has been adapted to human existence it has only been made even more hostile than before.